In 2010 TRECVID confronted known-item search and semantic indexing systems with a new set of Internet videos (referred to in what follows as IACC) characterized by a high degree of diversity in creator, content, style, production qualities, original collection device/encoding, language, etc - as is common in much "Web video". The collection also has associated keywords and descriptions provided by the video donor. The videos are available under Creative Commons licenses from the Internet Archive. The only selection criteria imposed by TRECVID beyond the Creative Commons licensing is one of video duration - they are short (less than 6 min). In addition to the IACC data set, NIST began developing an Internet multimedia test collection (HAVIC) with the Linguistic Data Consortium and used it in growing amounts (up to 8000 h) in TRECVID 2010-present. The airport surveillance video, introduced in TRECVID 2009, has been reused each year since. New in 2013 was video provided by the BBC. Programming from their long-running EastEnders series was used in the instance search task. An additional 600 h of Internet Archive video available under Creative Commons licensing for research (IACC.2) was used for the semantic indexing task as planned from 2013 to 2015 with new test data each year. In 2015 a new Video Hyperlinking task (LNK) previously run in MediaEval was added in addition to separating out the localization task (LOC) from semantic indexing (SIN). In TRECVID 2016 NIST will continue 5 of the 2015 tasks with some revisions (INS, LOC, MED, SED, LNK), drop one (SIN), and add a new Ad-hoc Video Search task (previously stopped after 2009). A number of datasets are available for use in TRECVID 2016 and are described below. Here is the set of test anchors. Video and ASR will be available from a server at University of Twente in the Netherlands. Please download the appropriate permission forms from the active participant's area and follow the instructions at the top of each form to receive the download information. SED 2016 webpage with a link to the detailed evaluation plan will soon be available with additional details. It is assumed the user(s) are system experts and no attempt will be made to separate the contribution of the user and the system. The results for each system+user will be evaluated by NIST as to effectiveness - using standard search measures (e.g., probability of missed detection/false alarm, precision, recall, average precision)- self-reported speed, and user satisfaction (for interactive runs). An important need in many situations involving video collections (archive video search/reuse, personal video organization/search, surveillance, law enforcement, protection of brand/logo use) is to find more video segments of a certain specific person, object, or place, given a visual example. For the past six years (2010-2015) the instance search task has tested systems on retrieving specific instances of objects, persons and locations. New query type will be tested this year by asking systems to retrieve specific persons in specific locations. In 2016 NIST will create about 30 topics, of which the first 20 will be used for interactive systems. The task will again use the EastEnders data, prepared with major help from several participants in the AXES project (Access to Audiovisual Archives), a four-year FP7 framework research project to develop tools that provide various types of users with new and engaging ways to interact with audiovisual libraries. Given a collection of test videos, a master shot reference, a set of known location/scene example videos, and a collection of topics (queries) that delimit a person in some example videos, locate for each topic up to the 1000 shots most likely to contain a recognizable instance of the person in one of the known locations. Interactive runs are welcome and will likely return many fewer than 1000 shots. The development of fast AND effective search methods is encouraged. Development data: A very small sample (File ID=0) of the BBC Eastenders test data will be available from Dublin City University. No actual development data will be supplied. File 0 is therefore NOT part of the test data and no shots from File 0 should be part of any submission. Test data: The test data for 2016 will be BBC EastEnders video in MPEG-4 format. The example images in the topics will be in bmp format. See above for information on how to get a copy of the test data. Topics: Each topic will consist of a set of 4 example frame images (bmp) drawn from test videos containing the person of interest in a variety of different appearances to the extent possible in addition to the name of one location. Example images/videos for the set of master locations will be given to participants as well. For each frame image there will be a binary mask of the region of interest (ROI), as bounded by a single polygon and the ID from the master shot reference of the shot from which the image example was taken. In creating the masks (in place of a real searcher), we will assume the searcher wants to keep the process simple. So, the ROI may contain non-target pixels, e.g., non-target regions visible through the target or occluding regions. The shots from which example images are drawn for a given topic, will be filtered by NIST from system submissions for that topic before evaluation. Here is an example of a set of topics and here is a pointer to the DTD for an instance search topic (you may need to right click on "view source". Auxiliary data: Participants are allowed to use various publicly available EastEnders resources as long as they carefully note the use of each such resource by name in their workshop notebook papers. They are strongly encouraged to share information about the existence of such resources with other participants via the tv16.list as soon as they discover them. Each team may submit a maximum of 4 prioritized runs (note the example set exception mentioned above allowing up to 8 runs in one specific case). All runs will be evaluated but not all may be included in the pools for judgment. Submissions will be identified as either fully automatic or interactive. Interactive runs will be limited to 5 elapsed minutes per search and 1 user per system run. Please submit each run in a separate file, named to make clear which team it is from. EACH file you submit should begin, as in the example submission, with the DOCTYPE statement and a videoSearchResults element even if only one run is included. Submissions will be transmitted to NIST via a password-protected webpage. This task will be treated as a form of search and will accordingly be evaluated with average precision for each topic in each run and per-run mean average precision over all topics. Speed will also be measured: clock time per topic search, reported in seconds (to one decimal place). Video is becoming a new means of documenting everything from recipes to how to change a tire of a car. Ever expanding multimedia video content necessitates development of new technologies for retrieving relevant videos based solely on the audio and visual content of the video. Participating MED teams will create a system that quickly finds events in a large collection of search videos. Given an evaluation collection of videos (files) and a set of event kits, provide a rank and confidence score for each evaluation video as to whether the video contains the event. Both the Pre-Specified and AdHoc Event tasks will be supported. Submissions will follow the MED '15 paradigm of submissions being made as a single tarball bundle and minimal hardware/runtime reporting. Each team can submit up to 5 Pre-Specified Event runs and up to 2 AdHoc event runs. Each run must contain results for a given condition. For Ad-Hoc each event, the submissions will be pooled across all runs and a sample judged by human assessors at NIST. Mean inferred average precision will be used to measure run-level effectiveness. Details on the evaluation will be posted on this website. The localization task will challenge systems to make their concept detection more precise in time and space. Currently video search tasks are accurate to the level of the shot. In the localization task, systems will be asked to determine the presence of the concept temporally within the shot, i.e., with respect to a subset of the frames comprised by the shot, and, spatially, for each such frame that contains the concept, to a bounding rectangle. A new set of 10 concepts are being tested this year where some action concepts have been considered for evaluation. For each concept from the list of 10 designated for localization, NIST will distribute, about 5 weeks before the localization submissions are due at NIST for evaluation, a list of shots (~1000 videos) to be localized. Each video may or may not contain the concept. For each I-Frame within each shot in the list that contains the target, return the x,y coordinates of the upper left and lower right vertices of a bounding rectangle which contains all of the target concept and as little more as possible. Systems may find more than one instance of a concept per I-Frame and then may include more than one bounding box for that I-Frame, but only one will be used in the judging since the ground truth will contain only 1 per judged I-Frame, one chosen by the NIST assessor that is the most prominent (e.g., largest, clearest, most central, etc.). Assessors are asked to stick with this choice if a group of targets are repeated over multiple frames unless the prominence changes and they have to change their choice. The current test data set (IACC.2.A-C) is a collection of about 600 h and has been used between 2013-2015 in the Semantic Indexing task (SIN). Therefore participating systems are not allowed to use the IACC.2(A-C) annotations in their localization systems training by any means. The development data comprises the IACC.1.A-C data sets. However note that these collections only contains shot-level annotations (not bounding box ground truth data). A spreadsheet of the complete definitions of the concepts is available here. Participants in the localization task will submit in one file per run (up to maximum 4 runs allowed), the localization data for all and only the concept-containing I-Frames in the list of shots distributed by NIST. A standard set of I-Frames, grouped by each master shot and test video file, will be extracted by NIST using ffmpeg and made available to participants. Each line of submitted localization data will contain the following in groups of ASCII characters separated by 1 space. X and Y coordinates refer to the bounding rectangle. Assume the UpperLeft point in each frame image has coordinates (0,0), LowerRightX > UpperLeftX, LowerRightY > UpperLeftY. Please submit each of your runs in a separate file, named to make clear which team has produced it. Please use the concept ID number directly without adding 1000 in your run files. Measures: Temporal and spatial localization will be evaluated using precision and recall based on the judged items at two levels - the frame and the pixel, respectively. NIST will then calculate an average for each of these values for each concept and for each run. For each shot that is judged to contain a concept and in the distributed list of shots, a subset of the shot's I-Frames will be viewed and annotated to locate the pixels representing the concept. The set of annotated I-Frames will then be used to evaluate the localization for the I-Frames submitted by the systems. Professional and user generated multimedia content is stored in abundance by broadcasting companies and internet sharing platforms. The traditional way to provide access to these collections is via query-based search. However, in order to fully appreciate the content available to them in large archives, users need explorative ways to access content. The concept of Video Hyperlinking is proposed as a technology to enable this type of explorative access. In the longer term it might form the basis of a visual web that allows users to browse information in videos in the same manner as they do now in the textual web, jumping from one video to another. The goal in video hyperlinking is to suggest relevant to related target video segments based on the multimodal contents of the anchor video segment. A hyperlink originates from a video segment that a user is currently watching. We call this starting segment an anchor, which is defined by a start and an end time within a video. 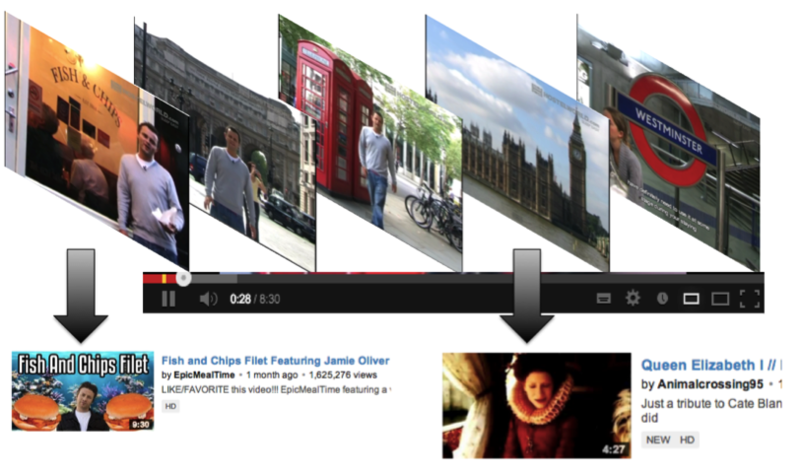 Here is an example picture giving an impression of video hyperlinking in a video segment on tourism in London: an item on a Fish & Chips restaurant could be linked to a cooking program describing a recipe for Fish & Chips, an item on the London Parliament could be linked to segments about England's Queen. Relevance of a link target can be based upon topical information, the events or activities depicted, the people present in the videos, etc. However, finding similar target video segments given an anchor video segments is not the aim in video hyperlinking. Video Hyperlinking task in 2016 investigates videomaker verbal-visual information in semi-professional user generated content (SPUG), which is commonly found on the Web. Multimodality: The videomaker's use of a combination of the audio and visual channels to communicate the information. Uploader Intent: The intent of the videomaker of the video to communicate information to the viewers. The focus on intent moves us away from information that is communicated incidentally by the video. Definition of Verbal-Visual Information: Sometimes people communicate information verbally, using spoken language. Sometimes they communicate information visually, by showing something. However, sometimes information is communicated by a combination of speaking and showing. "Verbal-visual information" is defined as information whose communication depends on the exploitation of both the audio and video channels of the video. If someone only listens to the video some the information will not be fully communicated; conversely, if someone only watches the video, the information will not be fully communicated. To communicate verbal-visual information both modalities are critically necessary. Definition of Videomaker: A "videomaker" is a user who creates video, also sometimes called the creator or the uploader. A videomaker is a semi-professional user if s/he has the goal to communicate a certain message to the audience, and is making use of conventional video production/editing techniques to do it. The videomaker does not necessarily make a living from creating video, and the content might also be less polished than professional content. Definition of Intent: "Intent" is defined to be the goal or the purpose with which someone undertakes something. In this case, we are interested in the goal the videomaker was trying to achieve by creating the video. The motivation for considering videomaker intent to be important derives from the investigation of uploader intent on YouTube that as carried out in [Kofler2015]. Among the intent classes identified by the study are: "Convey knowledge", "teach practice", and "illustrate", which are all related to explanation, e.g., the communication of information. In [Kofler2015], some initial evidence for a symmetry between the intent of users uploading video and the intent of users searching for video is uncovered. The implication is that any research progress we can make towards techniques oriented towards uploader intent, will also directly benefit users who are searching for video. Anchor Definition process: A person who knew the video collection well queried the collection for the linguistic cues, and then checked all the resulting videos by the keyframe. We attempted to keep a balance in the number of anchors that showed something happening with software on a computer screen. If there was a video which had exactly the same kind of uploader intent as had been used before we also skipped it. Otherwise, we made an anchor for every viable video where we felt that we could identify something that was meant to be shown and for which the visual and the spoken channel both contributed to communicating the information. We tried to make sure that the description of the anchor was concretely connected to its audio-visual content. However, if this connection was too literal there was a chance that no target segments would be found in the collection. The anchor selectors worked on getting the appropriate balance: but it was indeed a judgment call. Many of the anchors are going to be very challenging, but we hope that they are still interesting and will move the task into a new area. Given a collection of videos with rich metadata and a set of anchor video segments, defined by a video ID and start time and end time, return a ranked list of potentially relevant target video segments, defined by a video ID and start time and end time. Approaches for video hyperlinking typically operate in two steps [Ordelman2015b]: 1) anchor representation, which select a set of important features from an anchor, and 2) target search, which searches for the occurrence of these features in other video segments of the collection. For example, in the anchor representation step, a system might select the word sequence "fish and chips", or the appearance of the visual concept "red telephone booth" as important features of the anchor (the former could be found using named entity extraction and the later could be found by a corresponding visual concept detector). In the target search step, the system then searches for segments with occurrences of these features in the collection. We would like to make the following remarks about this general approach: Current approaches often use one modality for search ("fish and chips" is searched in spoken content and "red telephone booth" is searched in visual content). In 2016, we encourage multimodal approaches for hyperlinking, e.g. searching for the mentioning and/or visual appearances of fish and chips, or the mentioning of red telephone booths and/or their appearance, as this is how the anchors were selected and defined. Similarity in important features is often a clue for the relevance of a link target. Note, however, that highly similar, especially (near-) duplicate, segments are likely to be non-relevant as they are of no utility in the considered use scenarios. IMPORTANT CHANGE: Withdrawal of BBC data set. Due to issues around Data Protection and Programme Rights, BBC Research & Development regrets to announce that it will not be able to supply data to the TRECVID evaluation this year. BBC R&D is keen to find a way to way to resolve these issues. They aim to spend the next year establishing a dataset that can be supplied for future evaluations. However it will not be possible to do this in time for the 2016 evaluation. BBC apologises for the late notice of this and the inconvenience it will cause. In the context of this late notice, we decided to switch to the Blip10000 data set which consists of 14,838 videos for a total of 3,288 hours from blip.tv. The videos cover a broad range of topics and styles. It has automatic speech recognition transcripts provided by LIMSI; user-contributed metadata and shot boundaries provided by TU Berlin. Also, video concepts based on the MediaMil MED Caffe models are provided by EURECOM. The complete data set is made available in one package by the task organisers. Of course, task participants are welcome to use (and share) other metadata that you create. Anchors are defined by content creators such as media-researchers. Besides the video plus the start and end times of an anchor, the content creators also provide assessment details of why they selected the anchor and what kind of targets they expect. This information will be used for assessment only and will not be provided to participants until the release of submissions evaluation results. A team can submit up to four runs. The mandatory format of each item returned by a run is similar to the usual TREC format: <qid> Q0 <videoid> <startTime> <end> <rank> <score> <RUNID>where <qid> is the ID of the anchor and time values have to be stated in X.Y format, where X.Y stands for X minutes and Y seconds since the start of the video (note that Y is not a fraction of X). Targets pointing to the video of the anchor should be excluded and will be disregarded during the evaluation. Targets for a given anchor must not overlap. The filename of run has to contain a classification of the approach according to several criteria (features and segmentations used etc) and give a hint of the approach taken. Participants can provide up to 1000 proposed link targets. Runs will be submitted to a password-protected website at NIST and then forwarded by NIST to the task coordinator for evaluation. We will evaluate the relevance of the top results, as well as look into the diversity of the provided hyperlinks. The evaluation of the submissions will follow the Authored hyperlinking use scenario: Top ranked targets of participant submissions will be assessed using mechanical turk (MT) workers. Additionally, separate assessments will be created by target users on a subset of the data to identify potential discrepancies of evaluation results based on MT workers. Assessment instructions from anchor creators will be displayed to both group of assessors. The primary reported effectiveness measure will be MAiSP [Racca2015]. Additionally we will report several traditional precision oriented measures, adapted to unconstrained time segments, see [Aly2013]. [Aly2013b] Aly, R. and Ordelman, R.J.F. and Eskevich, M. and Jones, G.J.F. and Chen, S., Linking Inside a Video Collection - What and How to Measure? LiME workshop at the 22nd International Conference on World Wide Web Companion, IW3C2 2013, May 13-17, 2013, Rio de Janeiro, pp. 457-460. [Jarvelin2002] Järvelin, K. and Kekäläinen, J., Cumulated gain-based evaluation of IR techniques. ACM Transactions on Information Systems (TOIS) 20.4 (2002): 422-446. [Kofler2015] Kofler, C. and Bhattacharya, S. and Larson, M. and Chen, T. and Hanjalic, A. and Chang, S.F., Uploader Intent for Online Video: Typology, Inference, and Applications, in IEEE Transactions on Multimedia, vol. 17, no. 8, pp. 1200-1212, Aug. 2015. [Ordelman2015] Ordelman, R.J.F. and Aly, R. and Eskevich, M. and Huet, B. and Jones, G.J.F., Convenient discovery of archived video using audiovisual hyperlinking. (2015). [Ordelman2015b] Ordelman, R.J.F. and Eskevich, M. and Aly, R. and Huet, B. and Jones, G.J.F., Defining and Evaluating Video Hyperlinking for Navigating Multimedia Archives. In Proceedings of the 24th International Conference on World Wide Web Companion (pp. 727-732). International World Wide Web Conferences Steering Committee. (2015, May). [Racca2015] Racca, D. N. and Jones, G.J.F., Evaluating Search and Hyperlinking: an example of the design, test, refine cycle for metric development. In Working Notes Proceedings of the MediaEval 2015 Workshop, Wurzen, Germany, 2015. Automatic annotation of videos using natural language text descriptions has been a long-standing goal of computer vision. The task involves understanding of many concepts such as objects, actions, scenes, person-object relations, temporal order of events and many others. In recent years there has been major advances in computer vision techniques which enabled researchers to start practically to work on solving such problem. A lot of use case application scenarios can greatly benefit from such technology such as video summarization in the form of natural language, facilitating the search and browsing of video archives using such descriptions, describing videos to the blind, etc. In addition, learning video interpretation and temporal relations of events in the video will likely contribute to other computer vision tasks, such as prediction of future events from the video. Matching and Ranking: Return for each video URL a ranked list of the most likely text description that correspond (was annotated) to the video from each of the sets A and B. Scoring results will be automatic against the ground truth using mean inverted rank at which the annotated item is found or equivalent. Description Generation: Automatically generate for each video URL a text description (1 sentence) independently and without taking into consideration the existence of sets A and B. Scoring results will be automatic using the standard metrics from machine translation such as METEOR, BLEU or others. Systems are encouraged to also take into consideration and use the four facets that annotators used as a guideline to generate their automated descriptions. Systems are allowed to submit up to 4 runs for each set in the Matching and Ranking subtask and 4 runs in the Description Generation subtask. Please use the strings ".A." and ".B." as part of your run file names to diffrentiate between set A and set B run files. A run should include results for all the testing video URLS (no missing video URL_ID will be allowed). No duplicate result pairs of "rank" AND "URL_ID" are allowed (please submit only 1 unique set of ranks per URL_ID). Please consult the readme file for more information regarding submission format. All automatic text descriptions should be in English. Once subscribed, you can post to this list by sending email to tv16.list@nist.gov, where they will be sent out to EVERYONE subscribed to the list, i.e., all the other active participants. If you would like to subscribe, see the MED webpage for contact information.